The ability to meet a schedule is a sought-after skill when it comes to design and construction projects. For our long-time friends at Hayes Green Beach (HGB), their goal to complete their four-phase "Promise Project" by October 2019 is significant because it coincides with when HGB will become Sparrow Eaton Hospital, the final step in becoming a full member of Sparrow Health System. 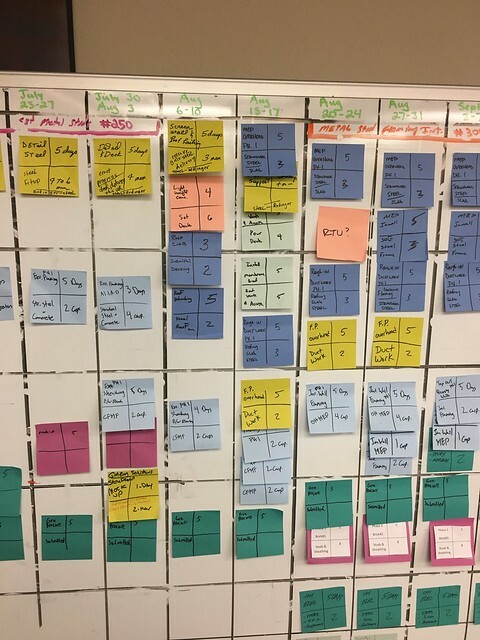 So that made this project a prime candidate for a "pull-planning" session that works in reverse of the traditional "push" approach that builds a schedule by sequencing each step to determine a completion date. Instead, with pull planning, a target date is set first. Then, the entire team works backwards from that date to identify any and all possible opportunities for scheduling efficiency by constantly asking "What must be done to achieve the goal?" Our recent pull-planning session, which included JJCA's David Johnson, Clark Construction Company out of Lansing, Michigan along with the many trade partners, and HGB’s Support Services Director, Randy Owens, resulted in eliminating several weeks of potential waste in the original construction schedule. Just one example of time savings identified during the session involved JJCA's process for reviewing and processing submittals. Our approach is much more streamlined than what the contractor typically experiences with other design firms. By identifying this and reducing the time allocated in the schedule for this step, key elements of construction like steel fabrication, can begin earlier. Learn more about "Promise Project" and the HGB/Sparrow affiliation here.